One question that we thought we should address is whether or not you can apply an epoxy coating over VCT (vinyl composite tiles) for your garage floor. The short answer is yes. Because VCT floors require regular maintenance in terms of waxing and the occasional stripping, home owners who love their VCT but not the regular maintenance of the floor are asking about applying an epoxy coating over the tiles. 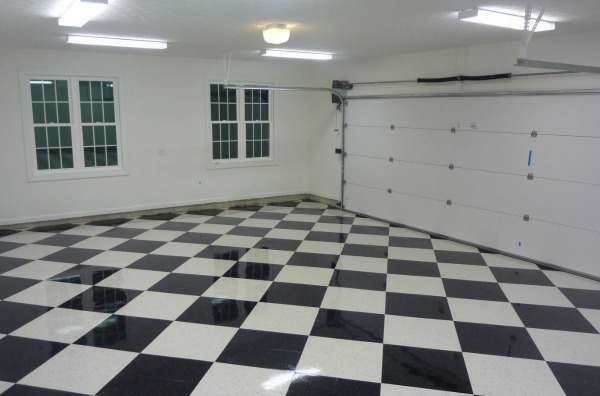 This garage flooring idea not only eliminates the waxing of the floor, it also provides for most of the same benefits in protection as an epoxy coated floor. One thing to keep in mind is that applying epoxy over VCT can sometimes be tenuous. Not everyone who has done this has been successful. The reasons vary from poor tile prep, lesser quality epoxy, and installation error. Another is moisture in the concrete. Previously laid VCT garage floors that stood up to moisture vapor transmission between the tiles can suffer epoxy failure when completely sealed. However, those who have paid attention to the details, including doing a moisture test first, has had the best success with this increasingly popular procedure. If you haven’t installed epoxy before, you may want to read up on how to apply epoxy coatings here first. In order for epoxy to adhere properly to vinyl composite tiles, it needs to be roughed up with 60 to 80 grit sandpaper. If you have an existing VCT floor, you will first need to strip the floor of all the wax that has been built up on the surface before you sand. If you haven’t laid your floor yet, you will still need to sand the tiles. Most new tiles come with a thin protective coating from the factory that you can sand right through so it doesn’t need to be stripped first. One note to make about sanding: If you have a floor with contrasting colors such as a black and white checkered floor, you need to be careful about the black bleeding or transferring into the white tiles when you sand. This is usually caused by excessive pressure on the sander, clogged up sandpaper or a combination of both. It doesn’t take much sanding at all to rough up the tile properly. Sanding tiles individually before laying the floor is not a good idea either. It can create small chips in the edges of the tile which will show when tightly butting them up together as you lay the tile down. The quickest way to create the rough finish that you need for the epoxy coating is to rent a lighter weight 13” floor buffer along with some 60 – 80 grit sanding screens. The sanding screen allows buildup to pass through the screen thus reducing a chance of color transfer to lighter colored tiles. The smaller buffer is also easier to control and does not create as much down pressure. Dual action orbital sanders also work well as does most other hand sanders; they just require more time to finish the floor. Remember to change the paper often to reduce buildup and always test a small area first. Do not use a belt sander. Once you have finished sanding you need to make sure the tile is clean and dry before applying the epoxy. First vacuum the surface with a shop vac and then wipe it down with a clean lint free cloth with denatured alcohol. This will provide for a clean and contaminant free floor. 100% solids epoxy (clear) is the best product to use for this application. It helps with filling any voids or small gaps between the tiles. Be sure to check with the epoxy manufacture first about compatibility before using their product on vinyl composite tile. Not doing this is one of the reasons for floor failures. Some companies such as Alpha Garage and Armor Garage actually endorse their epoxy for use on VCT garage floors. In order to assure the best application of the epoxy, we recommend that you apply it in two coats. The first coat is applied very thin using a squeegee to pull the epoxy tightly across the tile at a 45 degree angle like you would if you were grouting tile. In fact, it’s sometimes referred to as the grout coat. The objective here is to just fill any small gaps between the tiles (similar to grouting) and prevent outgassing. Outgassing is trapped air bubbles and/or small craters in the epoxy. This happens when air can’t escape a thicker coating or when it does escape, the epoxy has cured to a point that it won’t fill itself back in, thus creating a crater where the air was trapped. It doesn’t take much epoxy for the grout coat. Figure approximately 1 quart for every 200 square feet or so of floor, even less if the tiles are tight. You can always mix it 1 quart at a time and mix more as you need it. Once mixed, pour the epoxy out in a ribbon on the floor and start pulling it tight across the tiles with the squeegee. It’s OK if you leave a thin layer on the tile. The second coat can be applied normally using the squeegee to help spread it out if you like after pouring the ribbon and then back rolling the epoxy with a 3/8” lint free nap roller. Follow the manufacturer’s directions when applying the second coat. The first coat usually needs to feel tacky to the touch before applying the second coat and the second coat should be applied within 24 hours of the first coat. One thing to keep in mind is that epoxy can yellow (amber) over time when exposed to sunlight. It is more noticeable if you have any white tiles. We recommend for best results that you follow up the epoxy coat with a top coat of polyurethane. Not only will it help to keep the epoxy from yellowing, it will also improve the abrasion and chemical resistance of the floor. Once you’ve coated your vinyl composite tile with epoxy, you should have a long lasting and very durable finish to your floor for years to come. Plus, the extended effort will pay off in spades when you don’t have to go out to strip and re-wax your floor on a regular basis. No, that won’t work Steve. Moisture from concrete can cause epoxy to delaminate. It’s why moisture testing is recommended if it’s ever in question when applying a coating. Unfortunately, the only way to tackle your moisture problem is to pull the floor up and apply the proper sealer to mitigate it.